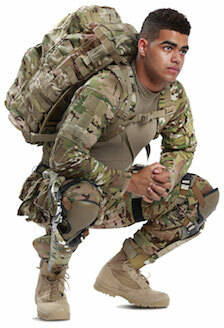 From next year, the US Army and Marine Corps will trial wearable technology for powering batteries. With soldiers carrying batteries that can add approximately 7 kg to their already heavy 41 kg load, lightening the weight your typical infantry soldier carries is an ongoing focus of future soldier programmes worldwide. Bionic Power developed PowerWalk, a light-weight, leg-mounted exoskeleton designed to accommodate a soldier’s full range of motion and harvest energy from the natural action of walking, in much the same way regenerative braking works in hybrid cars. On-board microprocessors analyse the wearer’s gait using Bionic Power’s proprietary control software to determine when to generate maximum power with the least amount of effort. On level ground, Bionic Power says the device requires minimal user effort to harvest power and, while power generation is its primary benefit, PowerWalk also reduces muscle fatigue during downhill walking. According to Bionic Power, wearing a harvester on each leg, users are able to produce an average of 10 to 12 watts of electricity which, over the course of an hour-long walk, can charge up to four smart phones. The walk-recharge capability of the PowerWalk reduces the requirement for soldiers to carry backup batteries, as well as the need for battery resupply in the field, the Vancouver-based company says. Bionic Power has received a contract valued at $1.25 million from the Office of the Secretary of Defense to supply low-volume production units of its PowerWalk® Kinetic Energy Harvester for field trials under the Joint Infantry Company Prototype (JIC-P) Program. This contract is in addition to Bionic Power’s existing contracts with the US Army. The JIC-P program aims to develop and test a system to provide power for dismounted infantry in order to reduce logistics resupply challenges and increase self-sustainability. Joint testing of Bionic Power’s PowerWalk device under the new contract will begin with the Marine Corps and the Army in early to mid-2017.